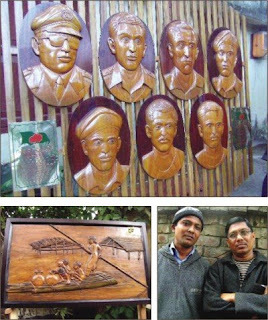 A three-day exhibition of exquisite woodwork was held in Faridpur recently on the occasion of Victory Day. 'Faridpur Sahitya O Sangskriti Unnayan Sangstha' (FSOSUS) organised the event at its premises in the town. The exhibition featured works of brothers -- artists Baharul Latif and Khabirul Latif from the Guhalaxmipur area. The duo put together a superb collection of woodcrafts, which impressed the visitors. Around 50 items including wood-carvings portraying iconic figures like Bangabandhu Sheikh Mujibur Rahman, Rabindranath Tagore, Kazi Nazrul Islam, 'Palli-kobi' Jasimuddin, the seven 'Birsherstha' and General Osmani were on display. Other noteworthy carvings were 'Baddhobhumi' (killing field), 'Durbhikkho' (famine), flood, river erosion, 'Opekha' (waiting), 'Ma-er Ador' (mother's love), 'Kafela' (caravan), 'Parapar' (crossing) and more. Bahar and Khabir have devoted six long years to put together these creations for the exhibition. Besides the satisfaction they have of organising such an event, they also aim to acquaint art enthusiasts with the history behind every piece. Some of their works also depict legendary global icons like Einstein, Archimedes, Leonardo da Vinci, Nelson Mandela, Mother Teresa and Yasir Arafat. Talking to The Daily Star, artist Bahar said that since he can recall, he was passionate about drawing. Later he joined the navy. He also worked in Kuwait from 1994 to '98. On his return to Bangladesh he decided to concentrate on his artistic abilities. But this time around instead of drawing, he started working with wood. His younger brother Khabir later joined him in this artistic endeavour. Khabir had lived in Dubai, Kenya and Jordan. His curiosity was fuelled after he saw the local woodcarvings there. When he returned home, he decided to work with his brother. Through highlighting the cultural practices, history and lifestyle, we intend to generate interest in Bangladesh among the young, they conveyed. While they have been financing their artistic venture with their personal savings, the brothers said that it would encourage them if the government or any organisation took the initiative to preserve these artworks.